A truly uninhabited tropical island, Whitehaven Beach is the ultimate sandy beach, and an award winner. 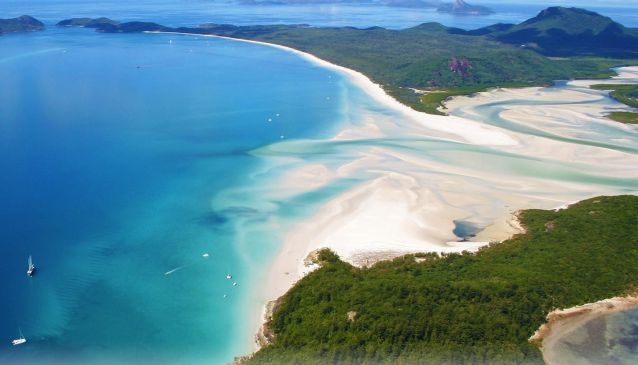 Take to the skies in a privately chartered helicopter for a scenic flight along Whitehaven Beach and Hill Inlet, before touching down to enjoy time in the water snorkelling with the fish or simply lazing on the white silica sand. Once you’ve explored and enjoyed your time on the island you’ll be feeling a little peckish, so tuck into a specially prepared beach picnic of open sandwiches, a selection of meats and salads, and a bottle of something bubbly (plus water and juice). Tours depart daily on request and don’t forget your swimming gear, sunscreen, hat and other beach accessories.